Check out our newest paper in PLoS ONE! Winogradsky columns are model microbial ecosystems prepared by adding pond sediment to a clear cylinder with additional supplements and incubated with light. Environmental gradients develop within the column creating diverse niches that allow enrichment of specific bacteria. The enrichment culture can be used to study soil and sediment microbial community structure and function. In this study we used a 16S rRNA gene survey to characterize the microbial community dynamics during Winogradsky column development to determine the rate and extent of change from the source sediment community. Over a period of 60 days, the microbial community changed from the founding pond sediment population: Cyanobacteria, Chloroflexi, Nitrospirae, and Planctomycetes increased in relative abundance over time, while most Proteobacteria decreased in relative abundance. A unique, light-dependent surface biofilm community formed by 60 days that was less diverse and dominated by a few highly abundant bacteria. 67–72% of the surface community was comprised of highly enriched taxa that were rare in the source pond sediment, including the Cyanobacteria Anabaena, a member of the Gemmatimonadetes phylum, and a member of the Chloroflexi class Anaerolinea. This indicates that rare taxa can become abundant under appropriate environmental conditions and supports the hypothesis that rare taxa serve as a microbial seed bank. We also present preliminary findings that suggest that bacteriophages may be active in the Winogradsky community. The dynamics of certain taxa, most notably the Cyanobacteria, showed a bloom-and-decline pattern, consistent with bacteriophage predation as predicted in the kill-the-winner hypothesis. Time-lapse photography also supported the possibility of bacteriophage activity, revealing a pattern of colony clearance similar to formation of viral plaques. 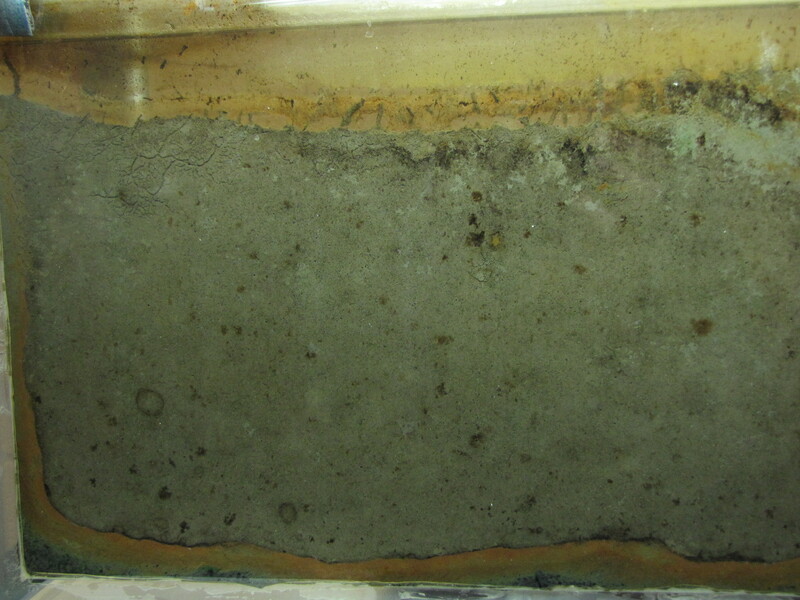 The Winogradsky column, a technique developed early in the history of microbial ecology to enrich soil microbes, may therefore be a useful model system to investigate both microbial and viral ecology. Check out the paper in PLoS ONE! Ethan Rundell ’13 worked in my lab for two years, his work culminating in first authorship on this paper. 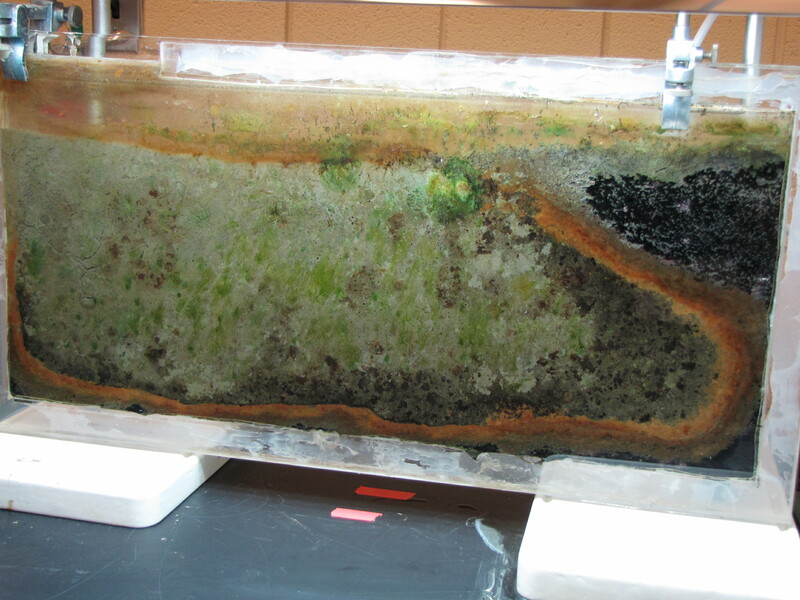 A Winogradsky column is a clear glass or plastic column filled with enriched sediment. 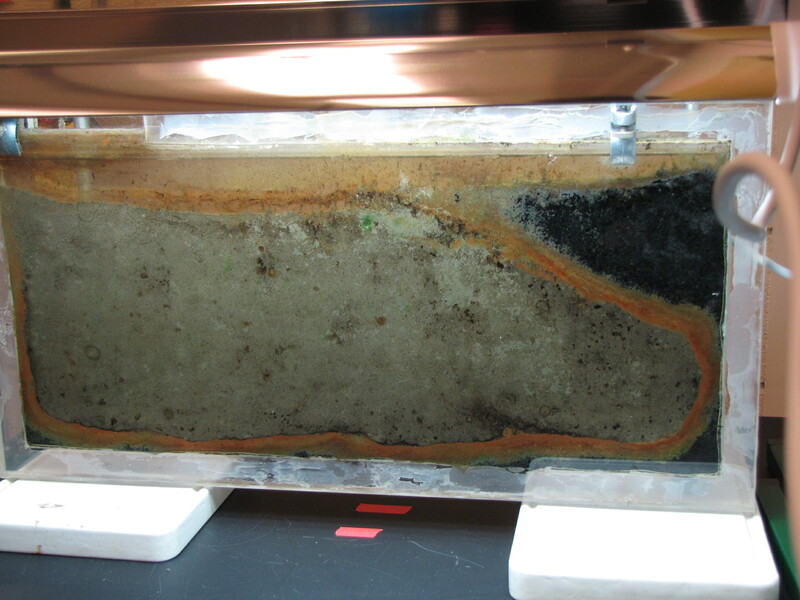 Over time, microbial communities in the sediment grow in a stratified ecosystem with an oxic top layer and anoxic sub-surface layers. 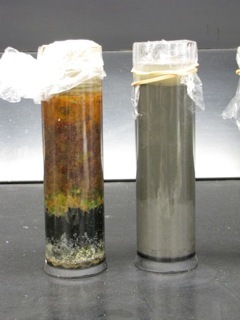 Winogradsky columns have been used extensively to demonstrate microbial nutrient cycling and metabolic diversity in undergraduate microbiology labs. In this study, we used high-throughput 16s rRNA gene sequencing to investigate the microbial diversity of Winogradsky columns. 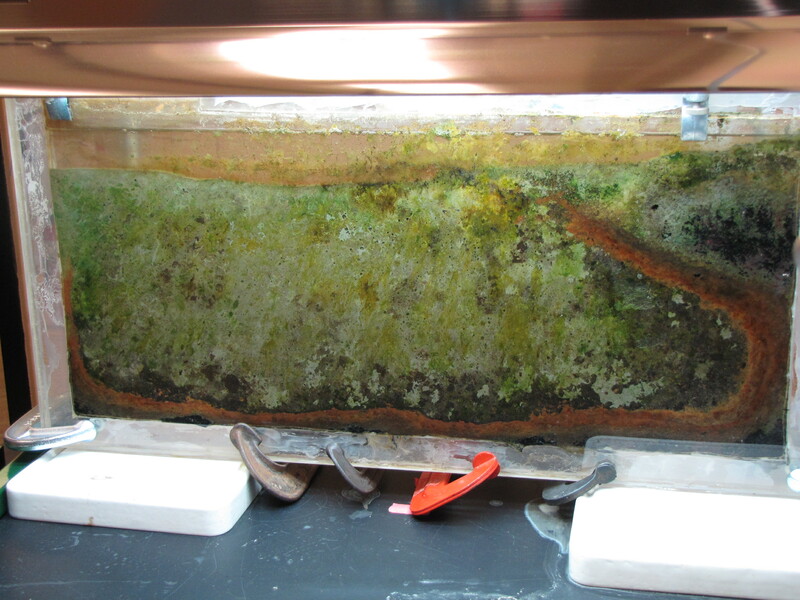 Specifically, we tested the impact of sediment source, supplemental cellulose source, and depth within the column, on microbial community structure. We found that the Winogradsky columns were highly diverse communities but are dominated by three phyla: Proteobacteria, Bacteroidetes, and Firmicutes. The community is structured by a founding population dependent on the source of sediment used to prepare the columns and is differentiated by depth within the column. Numerous biomarkers were identified distinguishing sample depth, including Cyanobacteria, Alphaproteobacteria, and Betaproteobacteria as biomarkers of the soil-water interface, and Clostridia as a biomarker of the deepest depth. Supplemental cellulose source impacted community structure but less strongly than depth and sediment source. In columns dominated by Firmicutes, the family Peptococcaceae was the most abundant sulfate reducer, while in columns abundant in Proteobacteria, several Deltaproteobacteria families, including Desulfobacteraceae, were found, showing that different taxonomic groups carry out sulfur cycling in different columns. This study brings this historical method for enrichment culture of chemolithotrophs and other soil bacteria into the modern era of microbiology and demonstrates the potential of the Winogradsky column as a model system for investigating the effect of environmental variables on soil microbial communities. 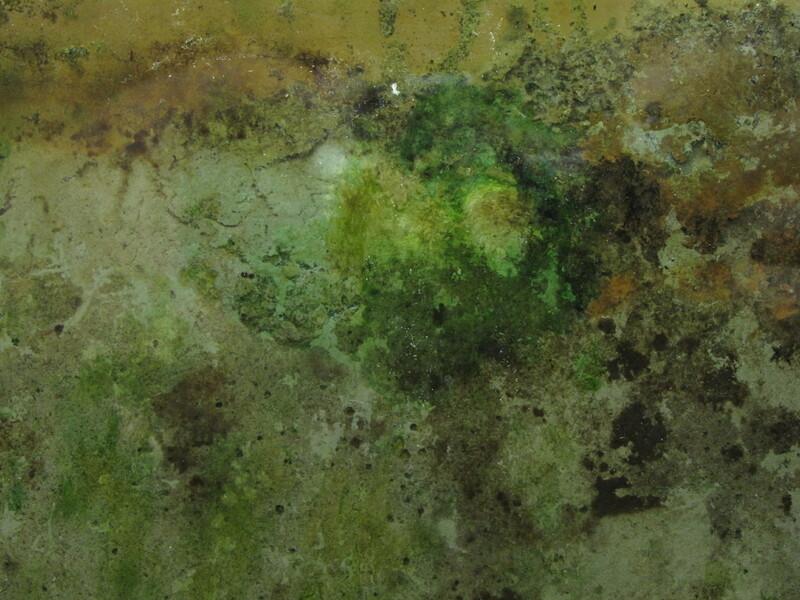 Various green bacteria are growing now all over the panel. These are likely to be cyanobacteria and some green sulfur bacteria. You may also notice the addition of clamps along the bottom. On Day 33, I arrived to find a puddle below the panel and all of the water drained out. Luckily, the crack was too small to let any soil out. The clamps are holding well so no more leaked out after I refilled it. Perhaps I can claim that this is an experiment in shocking the ecosystem with a drying and aeration event? I didn’t notice any significant changes in the following days and weeks, except the continued growth of green and yellow bacteria, so I suspect the shock wasn’t too detrimental. In the last several days, a filamentous green colony has developed. Note the large gas bubbles around it. This is likely a cyanobacteria like Oscillatoria, so the gas would be oxygen generated through its plant-like photosynthesis. The two images above show the top right corner of the panel at day 35 and then day 49. 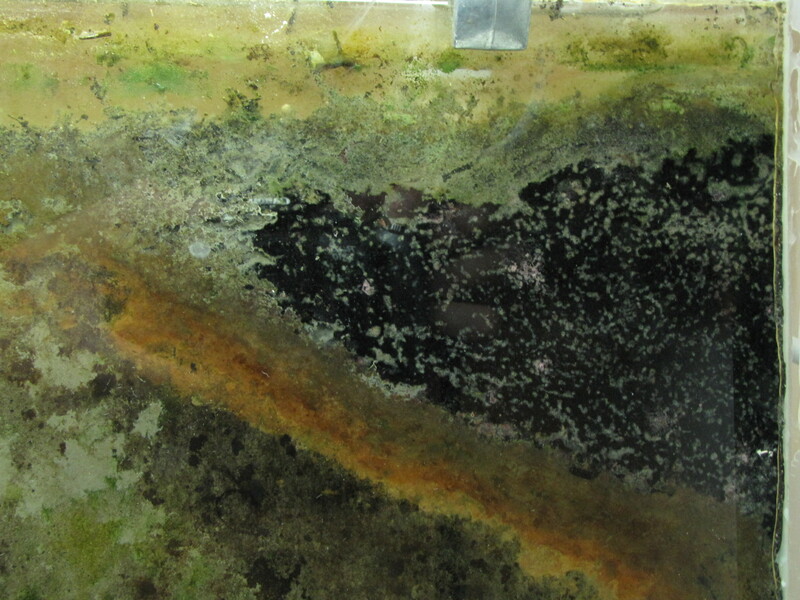 Notice how the black mud is slowly being covered by the growth of a very diverse mixture of microbes. 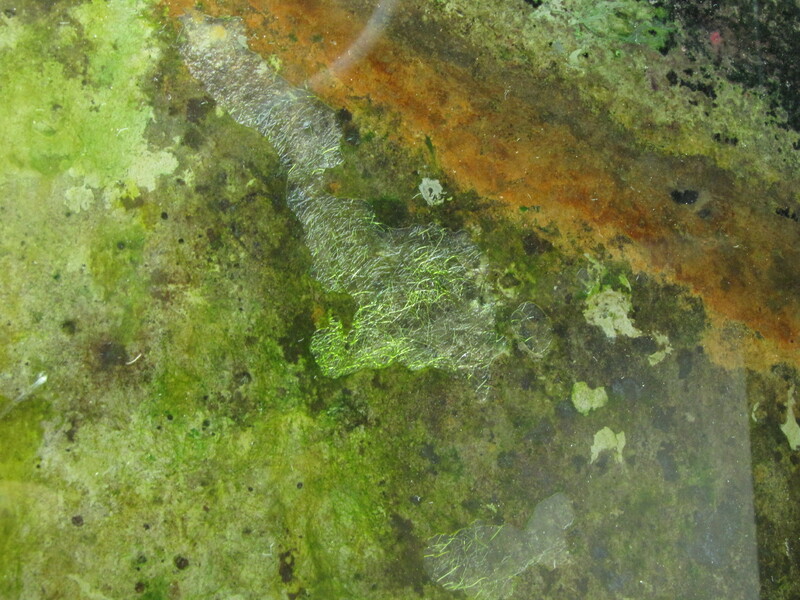 The pace of the changes in the Winogradsky panel has slowed, but now some green microbes are really noticeable. There are shades of bright blue-green, yellow-greens and yellow. 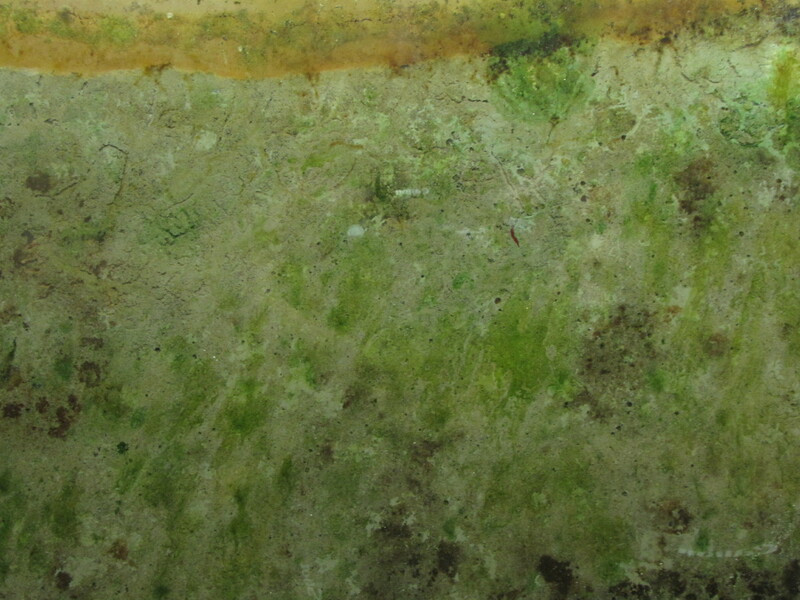 The range of greens is due to different combinations of pigments in photosynthetic bacteria. I had a recent conversation with someone who didn’t realize that organisms other than plants can photosynthesize. Many bacteria can, and like plants, they use a variety of different pigments to capture energy from light and use it to drive metabolic reactions in the cell. The green is from chlorophylls, the same as plants use. These are found in the cyanobacteria, which have the deeper blue-green color. But there are many others too: the “purple bacteria” have bacteriocholorophills and carotinoids, giving them a purple, yellow or brown color, and the bacteriochlorophylls of the “green sulfur bacteria” produce green or brown colors. The role of these pigments is to absorb different wavelengths of light to harvest the energy. Phototrophy in cyanobacteria is most similar to that of plants. In fact, the chloroplast, the organelle found in plant cells that carries out photosynthesis, is very similar to cyanobacteria. Most likely, early in the evolution of life, a larger cell engulfed an ancestral cyanobacterium and a symbiotic relationship evolved, eventually becoming plants. Like plants, cyanobacteria use water in the process of capturing light energy, producing oxygen. Some of the gas pockets seen in the Winogradsky might be oxygen. Other bacteria use a slightly different process, and use hydrogen sulfide instead of water, and produce sulfur. The sulfur forms globules, which are stored inside or outside the cell. Not all color is from pigmentation of cells however. 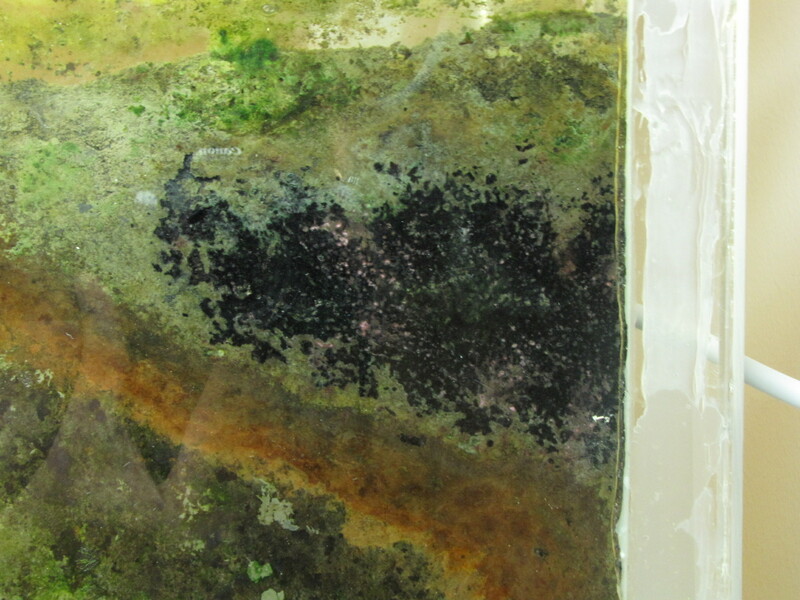 The red-oranges in the Winogradsky panel are likely due to a combination of pigmented cells but also due to the oxidation of iron. Some bacteria, like Chromatium, are able to use iron in phototrophy, instead of hydrogen sulfide or water. They oxidize the iron in the soil, and oxidized iron has a red-orange color (the rust on a car is oxidized iron). There are many interesting changes over the last few days. The black areas in the sulfur enriched mud are coalescing, and there are some light pinkish-red colonies developing at the surface. The olive-green band next to the orange is either disappearing or getting covered up as the orange stripe expands. 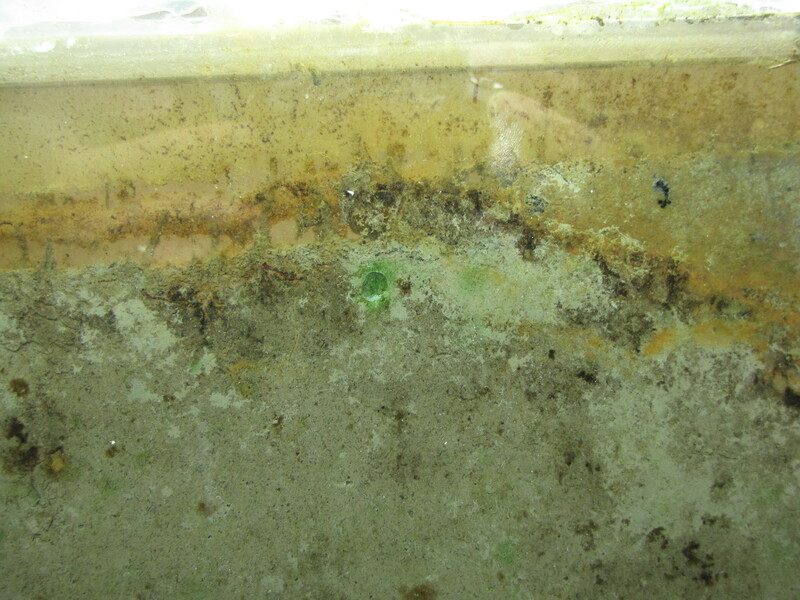 The unenriched mud is developing more visible colonies too, as various browns and some very pale greens start to appear. A few emerald greens are now visible, most of them very faint but there is one larger bright one with a big gas bubble. It turns out that the bloodworms (midge larvae) are not dead. In the past, when I have prepared columns (instead of a panel), they all die within the first few days. Here, they seem to be doing quite well. Notice the worm tracks in the top left (photos taken Day 11). It will be interesting to see how the bacterial colonies develop in this area in the presence of this disturbance. Crowdfunding to support virology research!